I'm a political theorist and Visiting Professor (through 2017) in the Program on Ethics, Politics and Economics at Yale. My interests include the history of political thought, toleration, democratic theory, political ethics, problems of coordination and convention, the realist movement in political theory, and the thought of David Hume. My first book, Ruling Passions: Political Offices and Democratic Ethics (Princeton, 2002) covered many of these topics, with a special focus on the varieties of democratic politics and the disparate qualities of mind and character appropriate to those who practice each of them. My second book Hume's Politics: Coordination and Crisis in the History of England was published in 2012; I am currently finishing a book on toleration, with the working title The Virtues of Hypocrisy, under contract with Harvard University Press. A Los Angeles native, I got my B.A. and Ph.D. from Harvard. Before coming to Yale I taught at Vanderbilt and at UCLA, where I was an Assistant, Associate, and Full Professor; and held visiting positions at Williams, Harvard, and Princeton. I am married to Miriam Laugesen, who teaches health policy and the politics of health care at the Mailman School of public health at Columbia, and we have a twelve-year-old son. Why colleges don’t “host” speakers—and why it matters. Those of us whose ceilings are not silicates mostly know that raucous protestors this past Thursday—some, though probably not all, students—prevented Charles Murray from speaking at Middlebury College, and confronted him in ways that amounted to assault (injuring a professor who was with him) when he tried to leave. There’s no lack of commentary on this; I have little to add to its substance. Like many, I think that judging Murray a poor scholar and a vicious racist (not far from my own opinion) does not constitute even a weak case for shouting him down or trying to beat him up. But less attention has been paid to how we talk about invited speakers in the first place. The college’s decision to host Murray. I understand how a tweeter or journalist trying to save words would say for short that Middlebury “hosted” Murray. (Later in the piece, Time similarly paraphrases Middlebury’s spokesperson as defending “the decision to host Murray”). But that locution is completely misleading and extremely pernicious. Author Andrew SablPosted on March 6, 2017 February 28, 2018 Categories Culture & Civil Society, Education6 Comments on Why colleges don’t “host” speakers—and why it matters. The Framers’ “demagogues” are our charismatic party leaders. What to do? The bad news: the constitution’s original design can no longer prevent the likes of Trump. The good news: new constitutional mechanisms can. I just posted something on the Washington Post’s Monkey Cage blog. It essentially points out that while Trump is exactly the kind of demagogue the Framers worried about, pretty much every political party leader is exactly the kind of demagogue the Framers worried about: modern parties and modern communications (by modern communications I mean U.S. mail-subsidized newspapers or later) pretty much guarantee that. One thing I didn’t say in the piece, for reasons of both space and The Monkey Cage’s distaste for explicit ideologizing, is that liberals can (unlike Peter Wehner, whose recent New York Times op-Ed I was responding to) hope to vindicate a different kind of constitution. Those who defend a living constitution, i.e. one that changes in good ways in response to political movements and social changes, often say that the old-fashioned constitution that sought to check power via a radically decentralized political system has yielded to a modern constitution that embraces greater federal power–as needed in a complex contemporary economy–but also vigorous protections for individual rights. (I got this from one of Jack Balkin’s recent books, but it seems pretty standard.) On a sophisticated version of this theory, the new constitutional order rests not only on judicial review but on a new model of citizenship in which the hallmark of civic virtue is to notice, and spring to the defense of, one’s own rights and those of others; so-called “popular constitutionalists,” whose work I know less well, stress the particular importance of social movements in making this work and, indeed, in changing how we think about the constitution in the first place. In other words, the best protection against the likes of a Trump is not constitutional conservatismâ€”which, after all, would welcome the likes of a Cruz. Rather, it is the complex of groups devoted to vindicating individual rightsâ€”the NAACP, La Raza, the ACLU, #BlackLivesMatterâ€”and those in the media, academe, and civil society poised to heed the kind of alarms that they sound. And, of course, the other party; but we shouldn’t have to rely on partisan opposition alone. Of course, on some level what I just said was already quite obvious, implicit in how we do things. But maybe thinking about Trump can make it more explicit. Bruce Ackerman has referred to moments of ferment regarding constitutional interpretation as “constitutional moments.” Trump have have given us a constitutional teachable moment. Author Andrew SablPosted on January 28, 2016 Categories Political Science4 Comments on The Framers’ “demagogues” are our charismatic party leaders. What to do? Why do empirical political scientists and political theorists define democratic quality so differently? A diagnosis and prescription. Academic readers should be able to download the full version easily as an .html or .pdf. Anyone else whose interest is piqued by the abstract should email me at my academic email address (not hard to find) and I’ll send you a version within a few days. Andrew Sabl’s review of Edmund Fawcett’s Liberalism: The Life of an Idea. Among other things, the book is forthright on how liberalism used to be deeply anti-democratic (and vice-versa). … Fawcett faces unflinchingly what too many of liberalismâ€™s historians and defenders ignore: liberalism was, at its origins, an elite and elitist position. It was cool at best towards democracy and consistently determined to define equality in ways that prevented it from entailing political equality. Between about 1880 and 1945, this changed for good. Judith Shklar once wrote, in terms that Fawcett might endorse, that liberalism and democracy shared a harmonious and monogamous marriage â€” but one of convenience. Fawcett chronicles the courtship and the prenuptial agreement. Liberals â€œsilenced,â€ though never â€œabandoned,â€ their doubts about democracy. Making an effort to shed its paternalist, improving disposition â€” swapping the schoolmasterly temperament of a Humboldt for that of the libertine, perpetually indebted Benjamin Constant â€” liberalism dumped its old favorite word, â€œcharacter,â€ for a new one: â€œchoice.â€ Democracy, for its part, changed substantially as well, from a radical and populist doctrine to one that made its peace with representation, elite-staffed bureaucracies, private property, and a definition of popular sovereignty that rendered it fairly empty rhetoric. One could summarize Fawcettâ€™s story like this: liberals kept their core ideas and gave up their deep, vicious prejudices regarding who could be trusted to live by them. Democrats, in turn, gave up the demos: they would no longer dream of â€œthe peopleâ€ acting, only of discrete people speaking and voting. The bargain seems, in good liberal style, mutually beneficial. Read the whole review here. And buy the book. George Washington knew what toleration meant: not condescension from on high, but everyone having to put up with someone. Writing a book about toleration is a funny thing. There are some political values that everyone claims to be for while arguing about what they are: e.g. freedom, justice, and since 1945, democracy. There are other values whose meaning seems relatively clear (meaning that there’s room for several books about what they mean but not several thousand) but which seem mostly good to some people and mostly bad to others, depending on ideology: solidarity, authority, social justice, and so on. And then there are a very few concepts that seem to mean something clearly bad to one group of people but clearly good to another for reasons having involving neither ideology nor an endless argument about political life (as with “democracy,” an essentially contested concept). Essentially, there’s a heated and permanent disagreement overÂ deep connotationÂ among people who seem not to disagree profoundly over value but probably disagree on how the world works. Some people think that concept X simply means something that would be generally agreed to be bad; others, the opposite. Perhaps “civility” is a little like that. “Toleration” definitely is. More precisely: a great many people who write about toleration think it’s obviously something hierarchical and condescending: a political authority arrogates the right to define which creeds or ideologies are wholesome, approved, and recommended as ideals but out of its infinite and self-congratulatory magnanimity chooses not to interfere with those who uphold different beliefs (while reserving the right to do so and clucking disapprovingly all the time). Another, equally respectable group, assumes that it’s synonymous with liberty and equality. On this view, toleration is what citizens of a diverse liberal polity practice towards one another all the time; we dislike many things about one another’s beliefs and practices, but indignantly, equally, and reciprocally reject the idea that interfering with others over them is our business. When it comes to conceptual care, I can’t improve on Rainer Forst’s work, which traces and distinguishes the two connotative dogmas with great wisdom and erudition. What I can do is debunk the very common belief that George Washington employed the former. In fact, the opposite is the case. He distinguished toleration from indulgence, and applauded the equality inherent in toleration, American style. This matters. For if we think a liberal and democratic society can do without toleration, we’ll make fundamental mistakes about how it works. Old wisdom apt for Baltimore: riots, though bad things, can still be signs of pressing grievances. Mobs arise from injuries. Regarding what’s going on in Baltimore, there are three separate questions. First, are the citizens of Baltimore (especially the African-American ones) justified in noting, and opposing, what seems on excellent evidence to be rampant, long-standing, and unpunished violence committed by police? Second, is rioting, including the burning down of a drugstore and a half-built community center, a wise and effective way of expressing that opposition? But third, how should the obvious answers to the first two questions affect our overall intellectual and emotional judgment? The first two questions have received enough attention. On the third, an old British sourceâ€”not Hume, for onceâ€”gets it just right. If you do not carefully distinguish the feelings of the multitude from their judgments; if you do not distinguish their interests from their opinions; attending religiously to the one and utterly despising the other; if you lay down a Rule that because the people are absurd, their grievances are not to be redressed, then in plain Terms it is impossible that popular grievances should receive any redress at all, because the people when they are injured will be violent; when they are violent, they will be absurdâ€”and their absurdity will in general be proportioned to the greatness of their Grievances. The worse their [the people’s] suffering the further they will be from their remedy. Who said that? After the jump..
Liberalism doesn’t just displace arbitrary power. It reduces it. Samuel Goldman at The American Conservative is wrong and Paul Krugman is right: liberalism doesn’t just change the ruling class but reduces the number of things that are “ruled” at all. It produces a real gain in liberty and and a reduction in arbitrary power. Both social insurance and civil rights are solvents that dissolve some of the restraints that hold people in place, be they unhappy workers or unhappy spouses. And thatâ€™s part of why people like me support them. The conservative position has never been simply that a hierarchical society is better than an egalitarian one. Itâ€™s that an egalitarian society isÂ impossible. Every society includes rulers and ruled. The central question of politics, therefore, is not whether some will command while others obey. Itâ€™s who gives the orders. Radical leftists understand this. Thatâ€™s why Leninâ€™s â€œwho, whom?â€ question became an unofficial motto of Bolshevism. The Bolsheviks promised that a classless society would one day emerge. In the meantime, however, they were open and enthusiastic practitioners of power politics. Krugman doesnâ€™t see the Ã©narques [the French technocratic elite] as a ruling class that need to be knocked down a peg because their authority isnâ€™t traditional. They wield power over other peopleâ€™s lives because they got good grades, not because they have a lot of money or are heads of households or leaders of religious communities. But academic meritocracy isÂ not the same thing as a fluid and fairer society. Itâ€™s certainly no fairer that some people are lucky enough to be smart than that others are good at making a fortune. There are serious arguments in favor of rule by a highly-trained administrative class within a moderately redistributive capitalist economy. … What modern liberals really want, however, isnâ€™t freedom or equalityâ€”terms that have no meaning before itâ€™s determined for whatÂ andÂ by whomÂ they will be enjoyed. As conservatives have long understood, itâ€™s a society in which people like themselves and their favored constituenciesÂ have more power while the old elites of property, church, and family have less. True, if I had to choose between giving great power over my life-choices to Cardinal Dolan and giving it to Cass Sunstein, I would, with the greatest reluctance, choose Sunstein. But I think Goldman is mistaken: that’s not the choice I face. Liberal governance doesn’t just mean replacing one set of rulers with another. It means taking many matters out of the sphere of “ruling” altogetherâ€”by leaving some of them up to individuals, and making others a matter of law and non-discretionary policy rather than arbitrary decision. Author Andrew SablPosted on April 16, 2015 Categories Governance, Moral philosophy7 Comments on Liberalism doesn’t just displace arbitrary power. It reduces it. At its fifth birthday, the ACA remains controversial because it imposes on the uninsured burdens and costs familiar to those who’ve always had employer-provided insurance but not to those who’ve always lacked it. The Affordable Care Act turned five years old yesterday. As any honest parent knows, that’s a common occasion for saying, “thank goodness: we survived.” And it’s as good an occasion as any for me to write a post I’ve been considering for some time but never got around to because I lacked the time for proper research on public opinion. Rather than delay longer, I’m writing it now as a thought piece. My confidence that I’m right is, for the moment, strong but fragile. It relies on the evidence of things not cited. Re. politicians who say “I’m not a scientist” re. climate: if you really think you don’t know, stop standing in the way of those who do. … Do they have opinions on how to best maintain our nationâ€™s highways, bridges, and tunnelsâ€”or do they not because theyâ€™re not civil engineers? Do they refuse to talk about agriculture policy on the grounds that theyâ€™re not farmers? How do they think we should be addressing the threat of ISIS? They wouldnâ€™t know, of course; theyâ€™re not military generals. No one would ever say these things, because theyâ€™re ridiculous. Being a policymaker in a country as large and complex as the United States requires making decisions on a variety of important subjects outside of your primary area of expertise. Voters wouldnâ€™t tolerate this â€œIâ€™m not a scientistâ€ excuse if applied to any other discipline, yet politicians appear to be using this line successfully to distance themselves from experts crucial for solving many of our countryâ€™s most important problems. I’d only add that the analogy is not quite exact. After all, the politicians saying “I’m not a scientist” aren’t actually refusing to take a stance on climate policy. They’re adducing their mock ignorance as reason to take a very firm position: against taking action to solve the problem that all the real science reveals to be urgent. It all reminds me of one of my favorite Jewish jokes. Two men in the old country are relaxing over glasses of tea. Yakov: You know, life is like a glass of tea. Yitzhak: Like a glass of tea? Why? Yakov: Why? How should I know why? What do I look like, a philosopher? If politicians think they lack the expertise to opine on science, fine. But then they would be well advised to defer to the damn scientists instead of standing in their way. 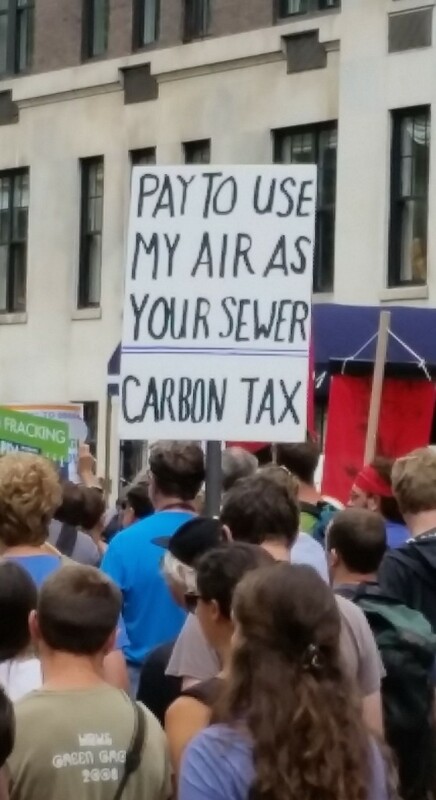 Takeaway message from the People’s Climate March: negative externalities should be taxed (or, if that’s impossible, regulated). Negative externalities should be taxed. And as aâ€”poor, but politically necessaryâ€”second choice, they should be regulated.